Published by Joshua Clare-Flagg on 13 Oct, 2015. 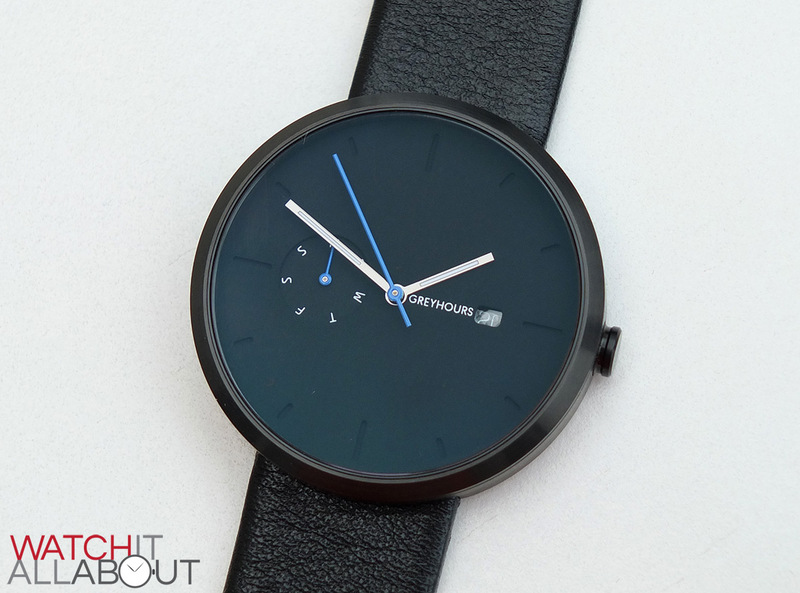 Greyhours are a fairly new brand that fought my eye just a few months ago. They’re ethos is right up my street – good design, good built quality, good specs – at a decent price. 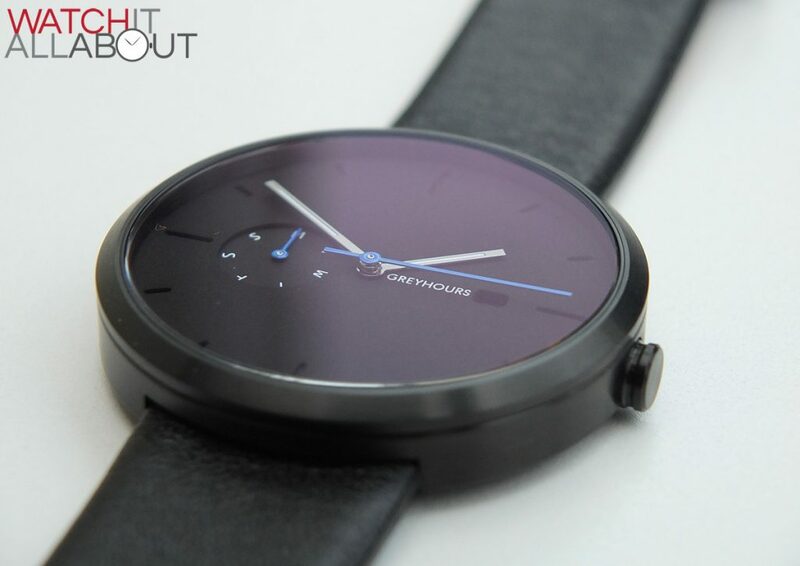 The Essential will cost you £150 and caught my eye thanks to its different, sleek design. Everything about it is very cool, including the packaging. 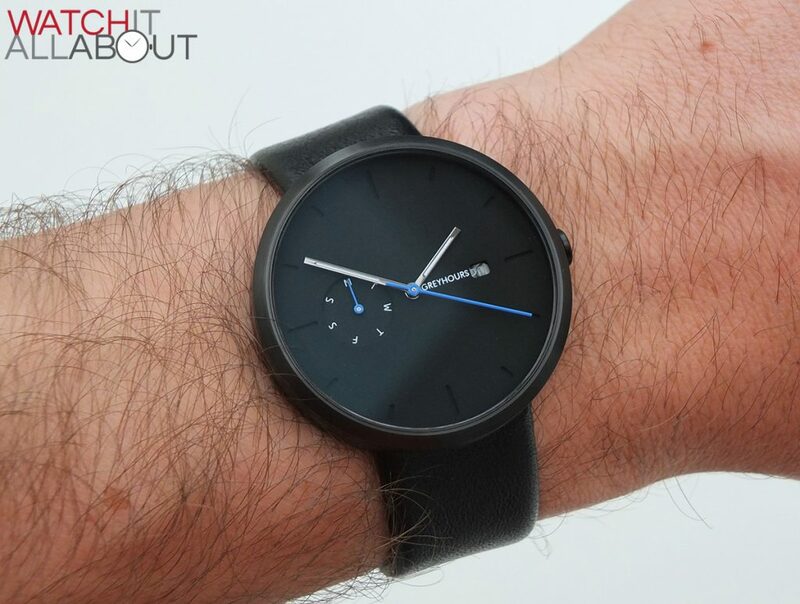 I love seeing watch brands making an effort with the whole package and this is definitely the case with Greyhours. Let’s take a closer look to see if it’s worth your hard earned-cash at £150. A quick nod to the lovely packaging. Great presentation, and a nice addition of a leather card case. 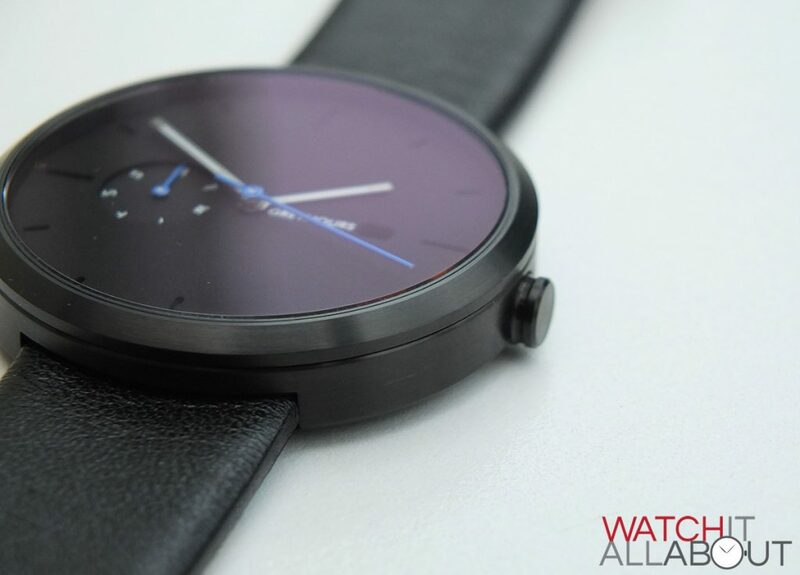 The first things that are most noticeable are the DLC coating, and the perfectly round case – as there’s no lugs. The Greyhours Essential measures in with a diameter of 40mm, and because it’s a round case with no lugs, to lug to lug length is also 40mm. It is 9.1mm tall, so quite streamlined, offering a good fit under sleeves. 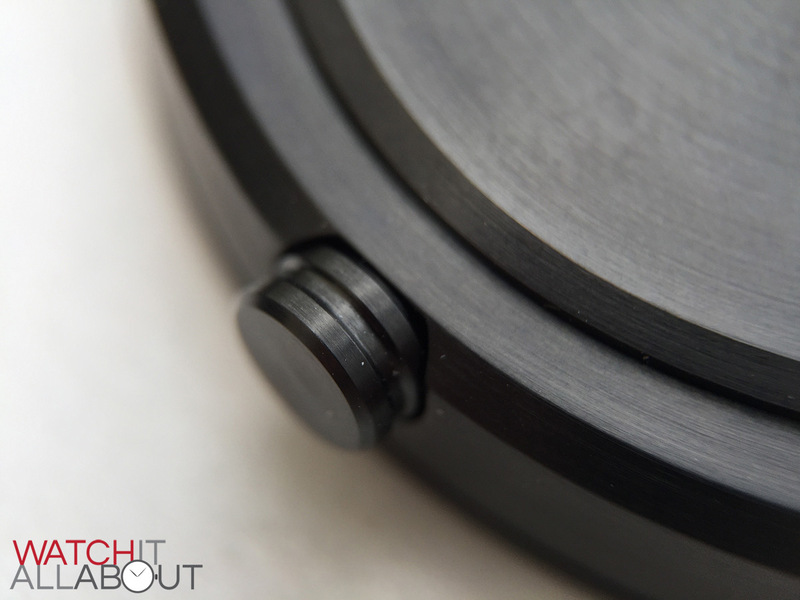 The case shape itself is alarmingly simple, with a bevelling around the bezel, and a indent about 2 mm down. 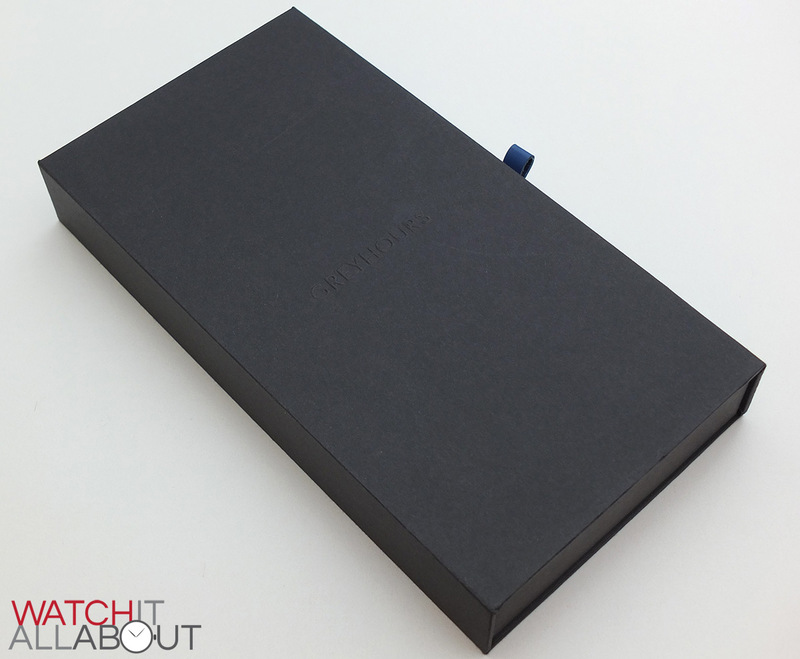 The case is made of 316L brushed stainless steel, with a impressively hard wearing. DLC coating. I’ve already accidentally knocked the case on a metal hand rail (quite hard too). I was fully expecting a mark to be there, with the steel appearing from underneath. But, as I peered down through gritted teeth I was extremely surprised and happy to see not a single mark! That, to me, is a great plus – knowing that this coating can take a knock easily shows that it’s well made and hard wearing. Onto another good feature, the sapphire crystal. It’s perfectly flat, and has a very impressive anti-reflective coating. 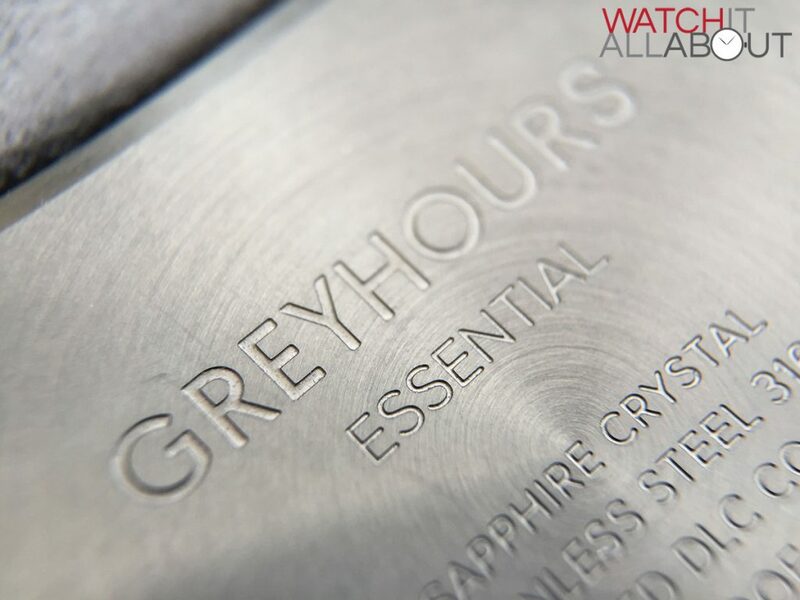 When I compare it to a number of other much more expensive watches in my watch box, the Greyhours stands out. 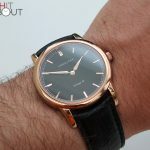 I personally feel that a quality AR coating really makes a difference with how a watch looks, and the Essential is punching above its weight in this regard. The push-pull crown is very simple, mimicking the case. It’s unsigned, brushed, and features an indent about halfway down. This indent is nice to look at, but it also proves to be very handy when pulling the crown out to adjust the time. The caseback is another aspect that’s well done. It’s almost a full circle, but with the top and bottom chopped off, so the strap can fit in on the underside of the case. It is secured by 4 screws, and the engraving is deep. 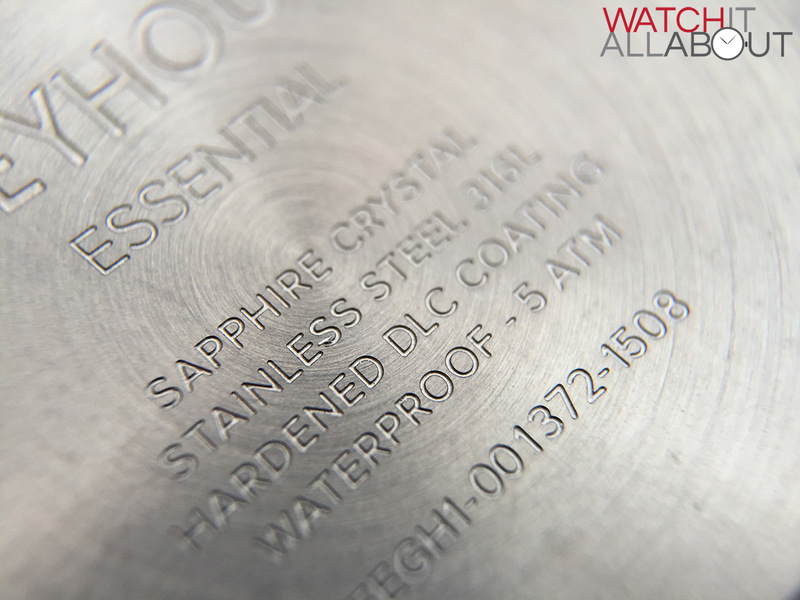 The engraving has various pieces of information, such as the name, sapphire crystal, DLC coating, water rating and serial number. The whole watch weighs in at 65g, so it’s fairly lightweight. 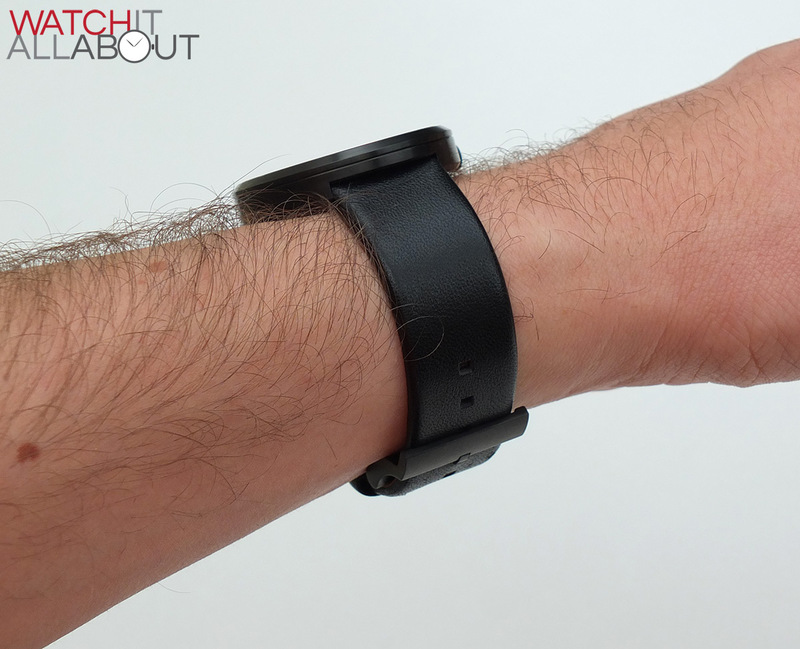 I find that this supports the easy, comfortable wearability of the watch. Finally, the water resistance of the Greyhours Essential is 50m. This is reasonable, as it’s suitable for shallow swimming if need be – but personally, I’d probably not bother. The stand-out features of the case are definitely the crystal and DLC coating. Both of which are very good for a watch costing £150. 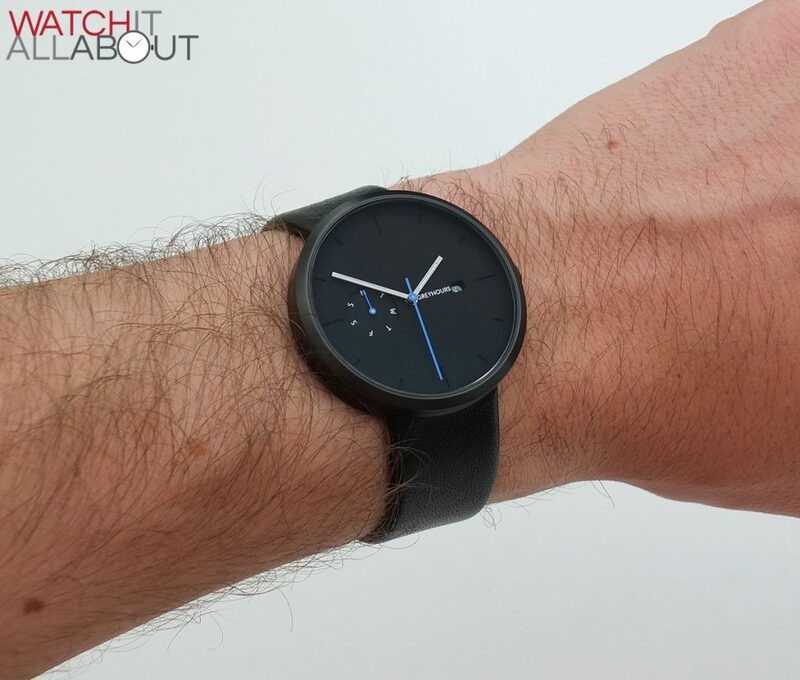 The simplicity continues to flow through to the dial. 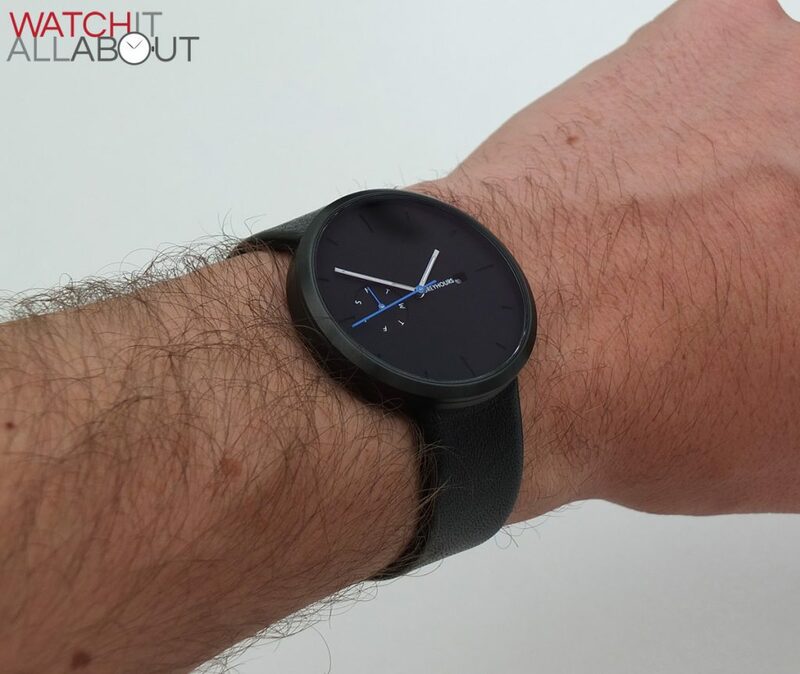 A matt black affair, the dial has a gentle texture to it. 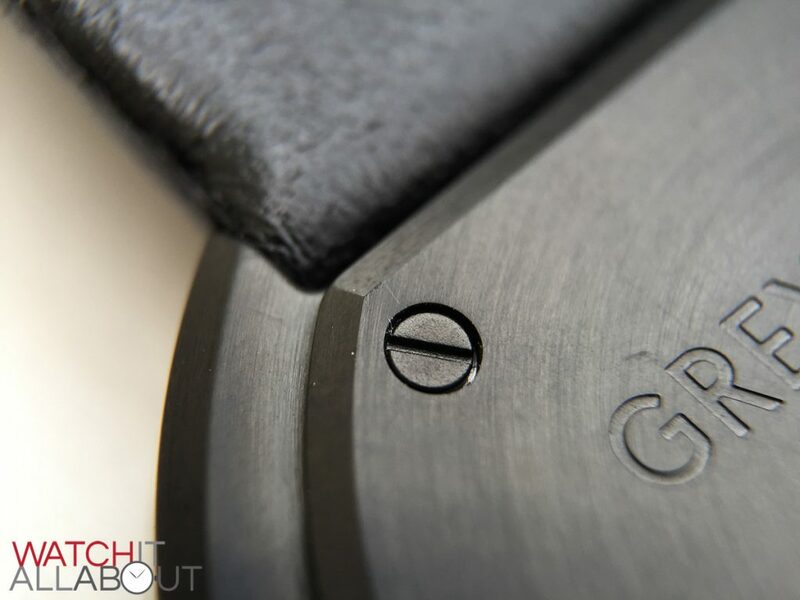 It is also a sandwich dial, where certain elements are hollowed out of a top layer, with another layer stuck underneath. 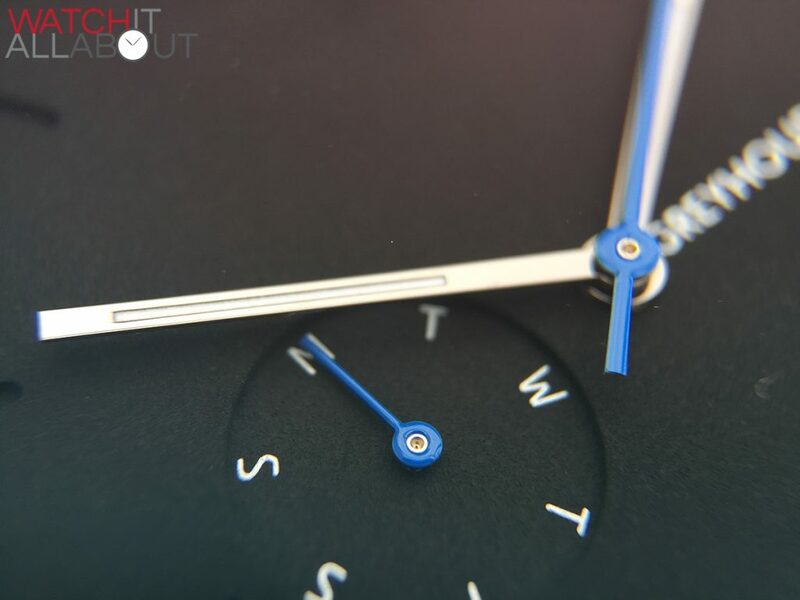 In the case of the Essential, it is the hour markers and day subdial that are on a lower layer. 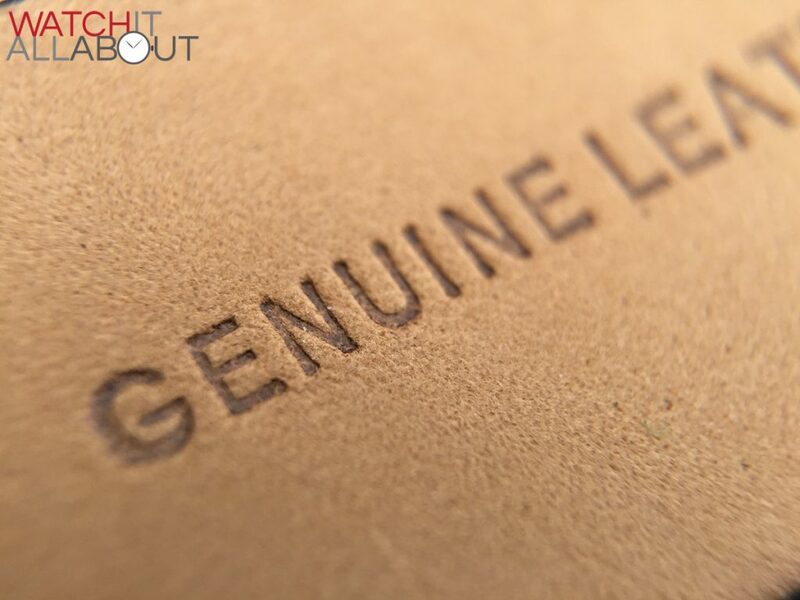 It’s a very minimal way of making things stand out, as there’s no need for paint, print or markings to distinguish those elements. The hands are also fairly simple – black batons with lume filled centres. 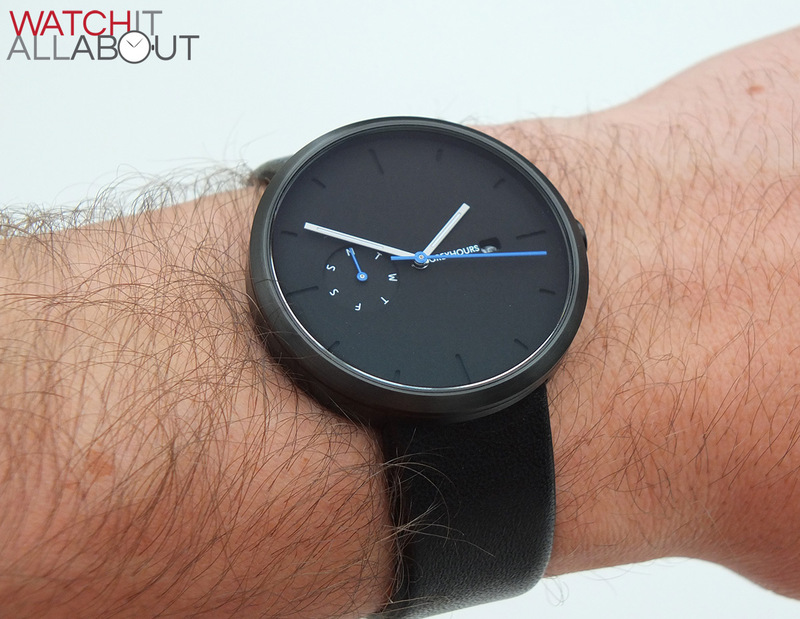 They’re black – on a black dial. That doesn’t seem so clever but the fact that they’re polished on a matt surface mean that they actually stand out quite well, offering good legibility. The lume isn’t the strongest, but I’ve come to expect that from watches in this price range… apart from Seikos and Scurfas. A splash of colour is introduced to the entire watch by the second hand and day pointer hand. These are both a light electric blue – colourful enough to make an impression but not too dazzling that they really stand out. 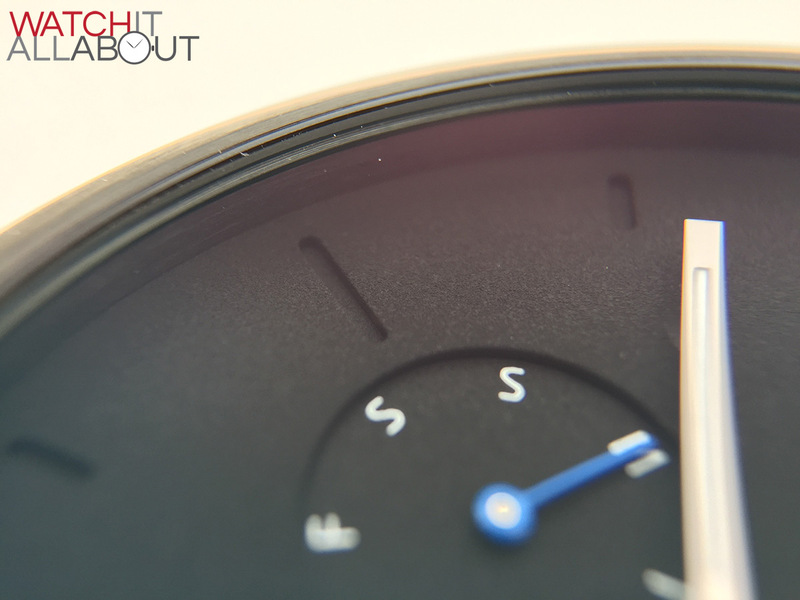 The only printing on the dial bar the days of the day indicator is the logo. Located at 3 between the stem and the date window, it can actually be mistaken for the hour hand at a glance. But, the printing is fine and accurate when under the macro lens. The main complaint I have with the Greyhours Essential is the date window. 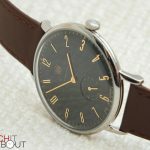 The date wheel itself is fine, in fact Greyhours have made a custom one with a different don’t which is a nice unexpected touch. The problem is that it’s too deep, and the window is too small. They’ve at least tried to make this good, by adding a magnification lens – but it doesn’t do enough, and in fact makes it harder to see at certain angles and light. If you’re not so fussed about telling the date easily, then this shouldn’t bother you. Apart from that one issue, the dial is great. 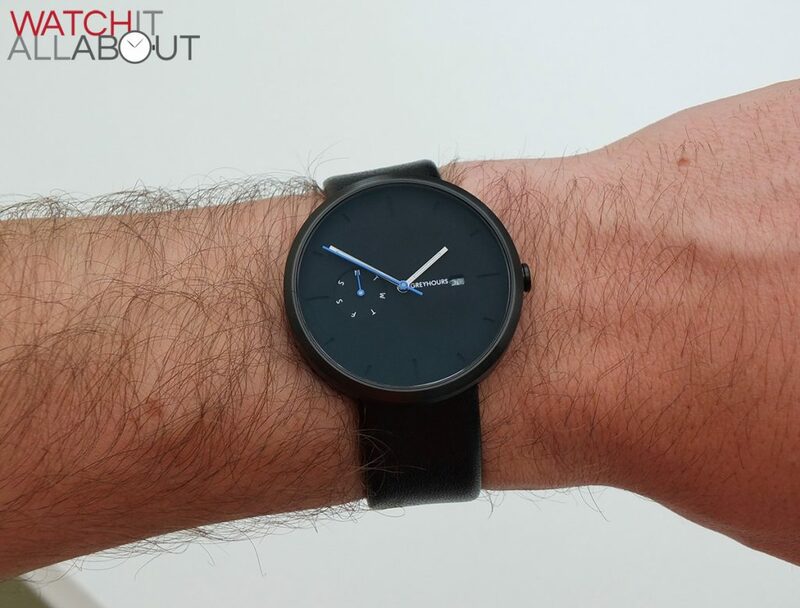 It’s well designed and well made… Exactly like the watch in general. 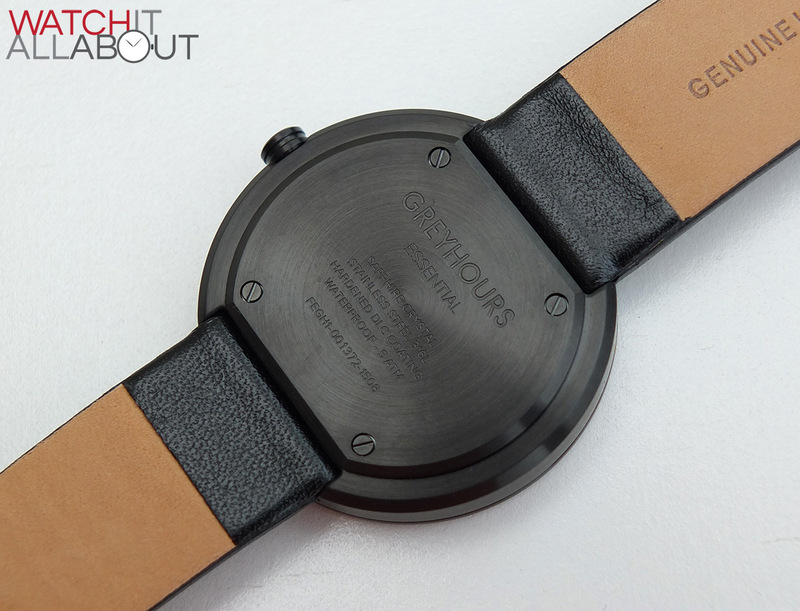 The Italian calf leather strap measures 20mm for the whole length. 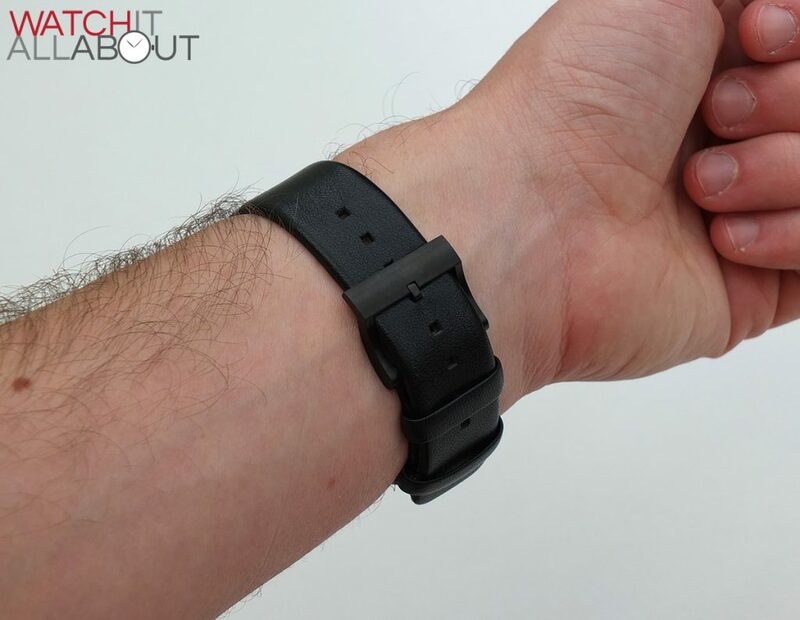 It is supple, soft and very comfortable on the wrist. Rather impressively, they’ve made it without any stitches visible at all – in order to keep the simple, minimal design. A nice touch. Really, there’s not much more to say about it, apart from it’s very good for the price. The buckle is DLC coated to match the case. Again, it’s very simple and gets the job done well. I was a little surprised when I noticed that there was nothing etched or engraved on the top bar. After a bit of a look around, I found that they had actually engraved the logo on the underside of the buckle. So they’ve obviously not missed it out or overlooked it, but rather have just moved it out of sight. 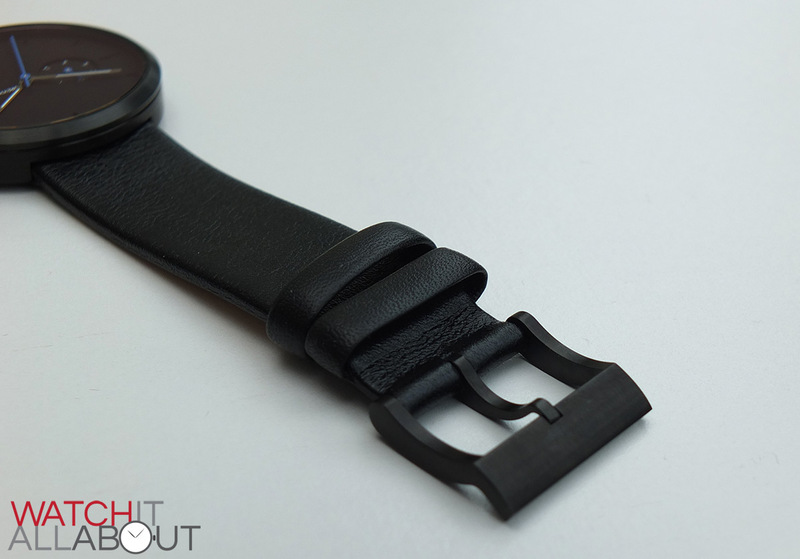 The strap is simple, minimal, and good quality for the price. 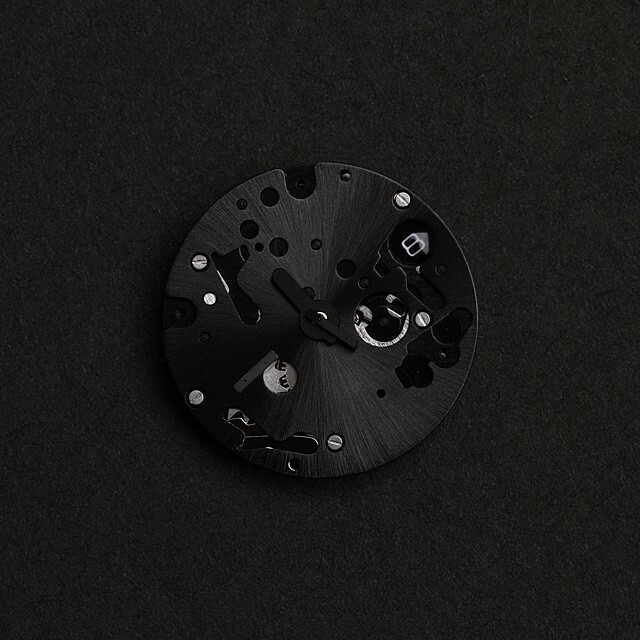 The movement powering the Greyhours Essential is the IsaSwiss Calibre 9232/1950. 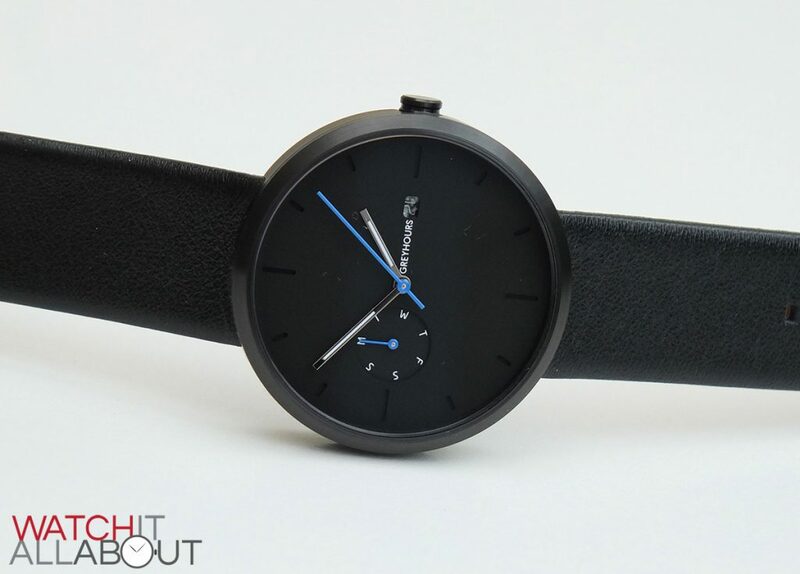 IsaSwiss are a Swiss movement maker with a factory in Switzerland and China. 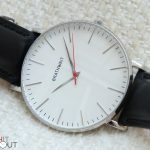 The movement in the Essential is a Chinese made movement, but it’s made to higher than normal standards due to it being governed by a Swiss manufacturer. The 9232/1950 is Quartz, and has a separate day and date indicator. 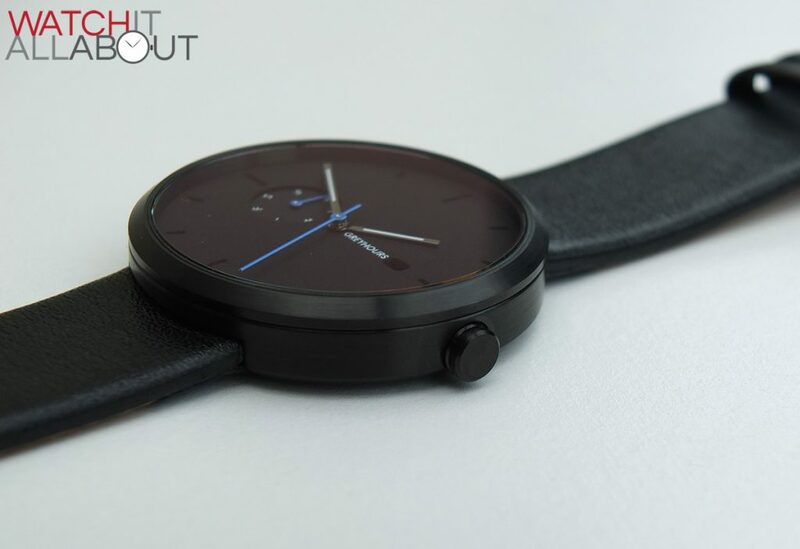 It has 0 jewels, an accuracy of -15/+15 seconds a month, and a 3 year battery life. 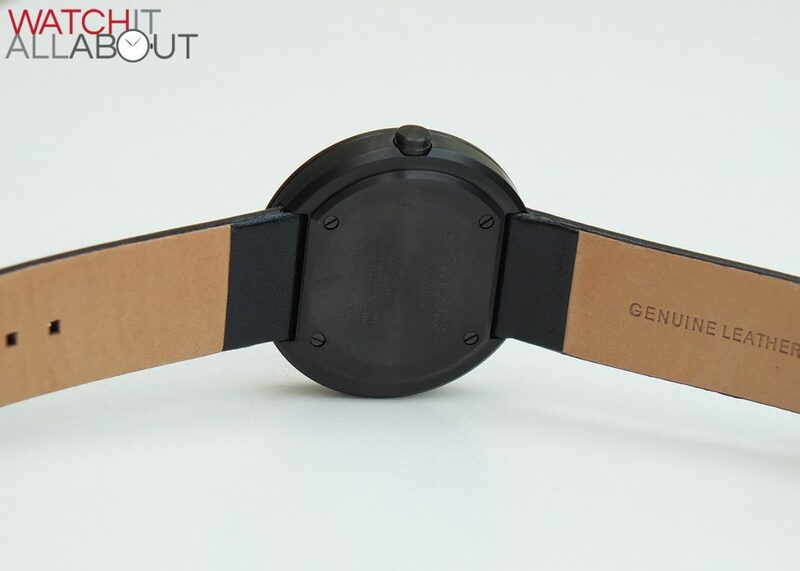 The original movement from IsaSwiss comes in gold color but we re-open the movements in house and send it to IP Plating in black color to that the watch is as sleek and beautiful outside than on the inside, even if the customer can’t see it. Then we rebuild the movement and assemble the watch. 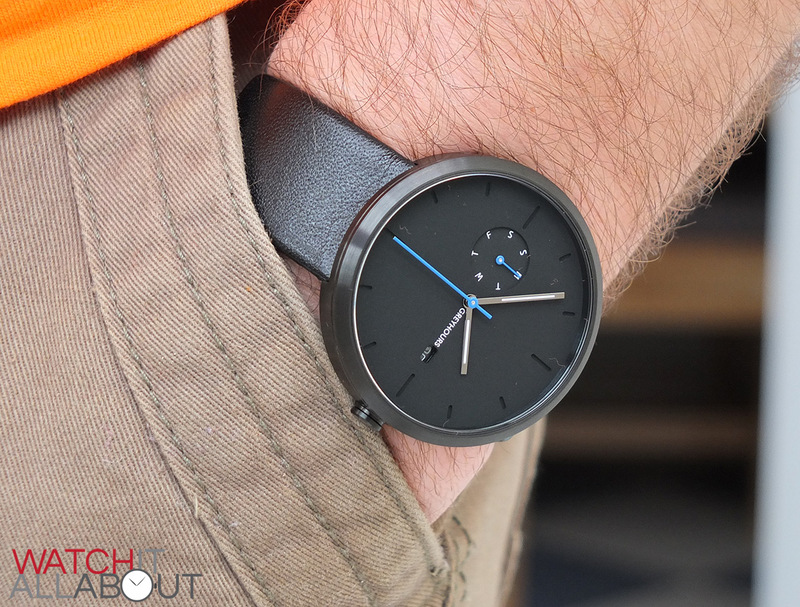 I don’t know about you, but that’s pretty cool to have on a £150 watch. 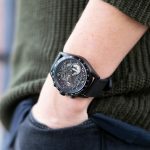 Yes you can’t see it, but it’s a nice ethos to have – Greyhours don’t seem to be happy with slapping any ol’ movement in, they want it to make it as good on the inside as it is on the outside. Well done to them for that. 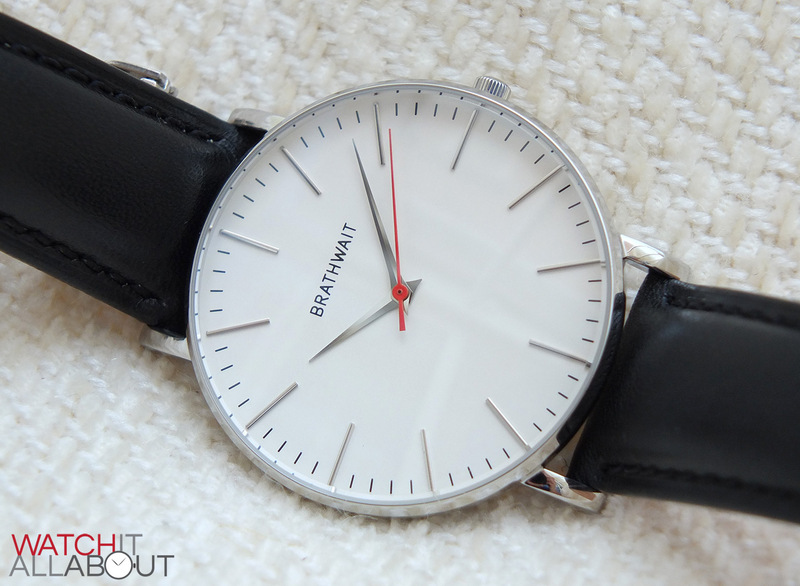 I think the closest thing at a similar price is the Brathwait Classic Slim. It’s minimal, albeit a bit smarter. It’s also a little cheaper at approx £100. There’s no denying that the specific design will only appeal to certain people. 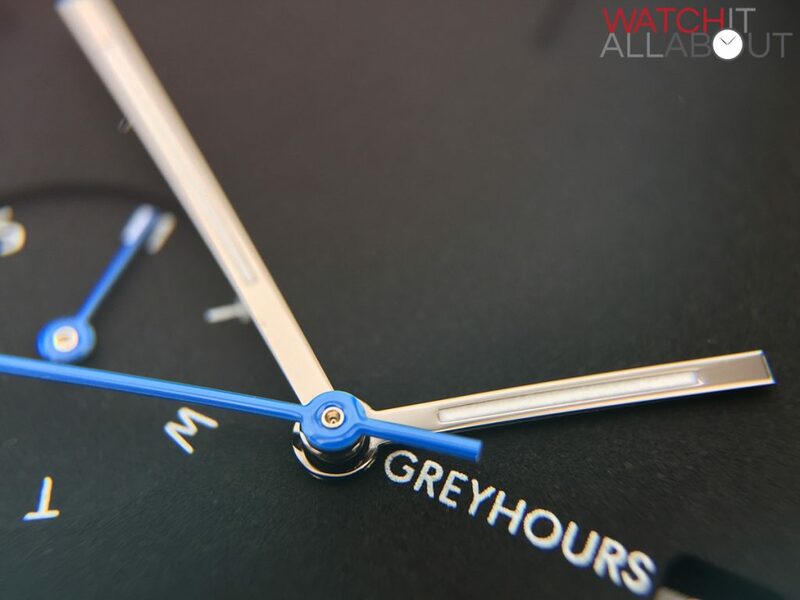 But, if you’re one of those who like how it looks – then I’m pleased to recommend the Greyhours Essential. 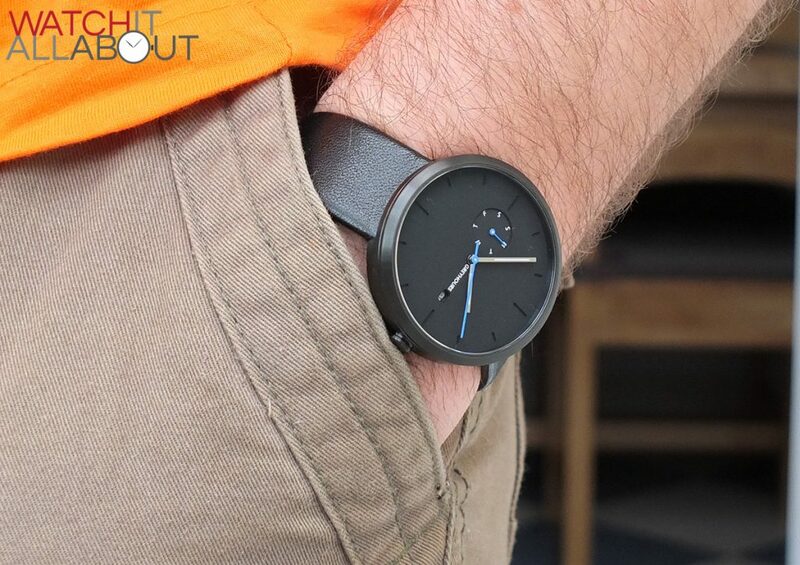 For £150, you’re getting a watch that’s punching above its weight. 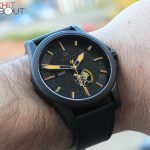 It has one of the best anti-reflective crystals I’ve seen on an affordable watch, lovely packaging, and the DLC coating is very impressive and hard wearing. The sub-£200 category is getting more and more competitive, so I really love it when I find a little gem like this one that performs very well within that price range. 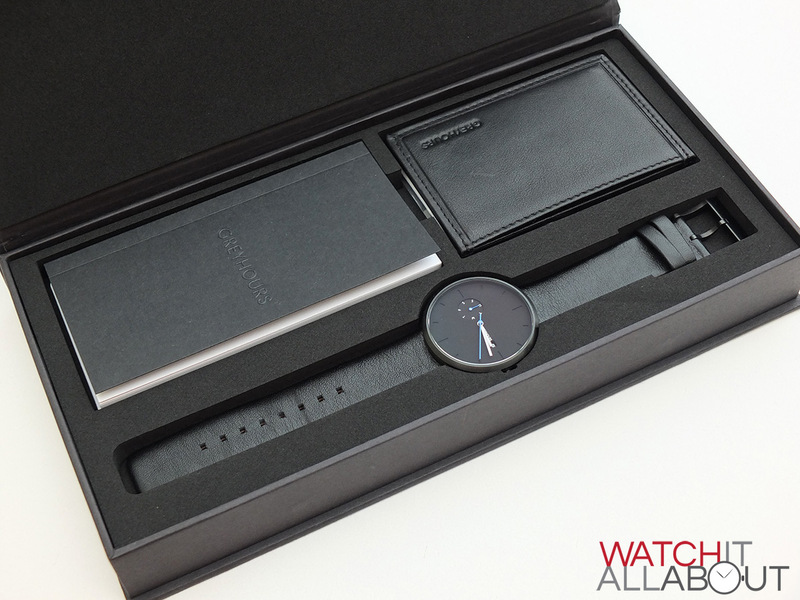 Just got my Greyhours watch, love the packaging and the watch. The date is a bit difficult to see as you said and the only other thing is the strap is quite short for me. You can buy a longer one, which I will do in due course. Overall very impressed, worth the wait in getting it.